Changes in population, the development of towns and villages, new farming practices and new industry all increase the demand for water. This demand will be higher in particular regions of the UK, such as the south-east of England. In much of the country surface water supplies are fully developed. In some regions groundwater may be able to address some of the shortfall, but an increase in the use of groundwater could impact on the environment . Groundwater plays an important role supporting aquatic ecosystems. It provides the water that sustains the flow of rivers in summer months, particularly those in areas underlain by permeable rocks. Many of the nation’s wetlands exist because of saturated ground resulting from a water table that is very close to the surface. An increase in abstraction of groundwater may cause the flow of groundwater into rivers to decrease or the groundwater levels in the vicinity of wetlands to fall, with potentially serious implications for their ecology and wildlife. We have to balance the needs of the environment against our need for water for drinking, agriculture and industry. Water supply problems are made worse by the legacy of pollution affecting our groundwater resources. 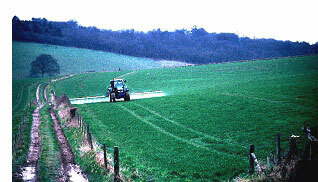 Pollutants include nitrate, which has increased largely due to intensive agriculture. Because groundwater moves so slowly much of this nitrate is still moving towards the boreholes that provide our groundwater drinking supplies. We can treat or blend waters to reduce nitrate concentrations in our supplies but this becomes increasingly expensive as nitrate levels rise. So here the balance to be made is between land use, farming methods and water supplies. Other types of pollution, such as that from past industrial activities, only add to the difficulties. Here the difficult choice is often whether the cost of cleaning up past pollution can be justified, and, if so, identifying who should pay. Sustainable development of our water resources will involve tough choices if we are to be able to provide the water that the nation requires, while protecting the environment; new water legislation and EU-wide standards are now in place to help provide this protection. But decisions on groundwater use are never simple: we may all be keen to see the impact of abstraction on river flows and wetlands reduced, but we also want cheap and plentiful water from our own taps; we want unpolluted water, but we also want good value in farming products; we want urban industrial pollution to be cleaned up, but we want local taxes to be kept low. Key to making the right decisions are processes that take account of your views. Agenda 21, a global action plan for sustainable development, agreed at the Earth Summit in Rio in 1992, asks governments around the world to work locally with communities to help ‘meet the needs of the present without compromising the ability of future generations to meet their needs'. We hope that this web site will help you understand some of the environmental and social issues facing groundwater.